How we got from Koh Tao, in the Gulf of Thailand, to Railay Beach, on the Andaman Coast. 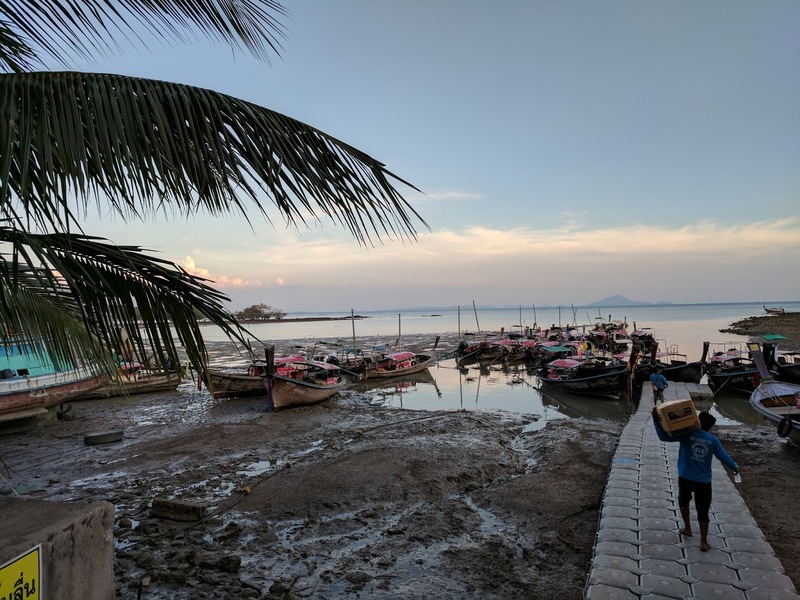 Three pick-up trucks arrived at our hotel, the Montalay Beach Resort, on the island of Koh Tao at 8am, to take us and several other guests across the island to the ferry pier. 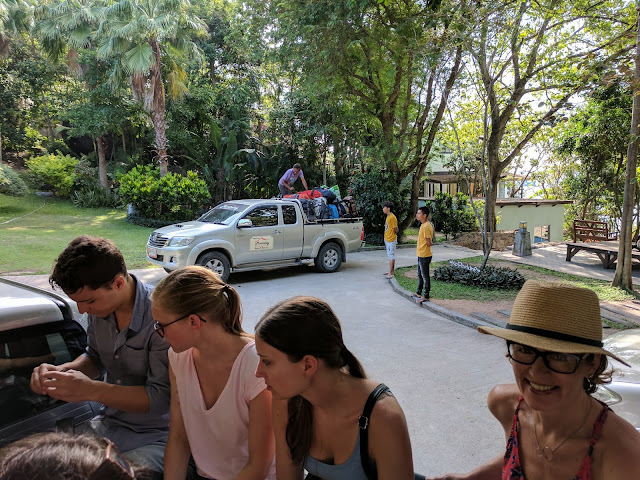 One truck was loaded with everyone’s luggage, as all of the tourists piled into the other two. The tower of luggage was piled so high in the back of the one truck that we had to wait some time while the taxi crew searched for a string to tie around some of the bags. Not quite sufficient, the employees piled a few of themselves on top of the bags to keep them in the truck on the extremely steep (twenty-something percent) incline over the middle of the island. Arriving safely (luggage included) at the ferry terminal, we found a line out of the shabby, open-air office, around the corner, and probably about 50 yards down a narrow street. We took our place at the end of the line, just as it started raining on us. Luckily the rain didn’t last long, and we eventually made it to the ticket desk, where they slapped “Railay” stickers onto us and tied transfer bracelets around our wrists. Literally. They actually put them on us. It was like being in kindergarten again. These are to help the employees figure out where the tourists need to be shuttled – treated very much like baggage – which seems to work out well. 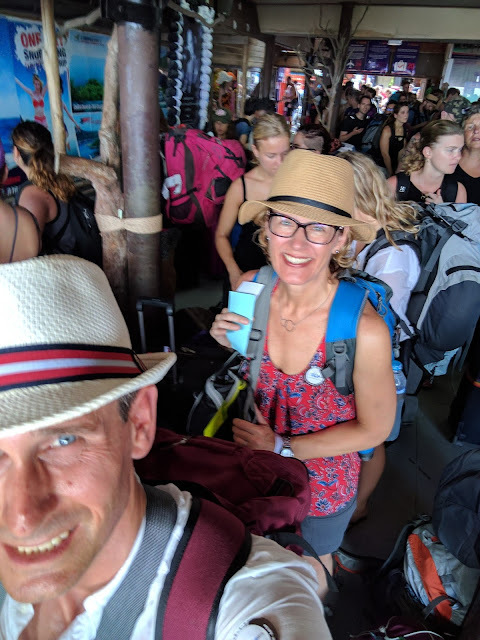 We waited to get on the boat, packed into the hot and humid waiting area on the pier, behind a French family, which included grandparents, a baby, and many massive suitcases. We couldn’t imagine how they were going to get off of the island with all of that stuff. 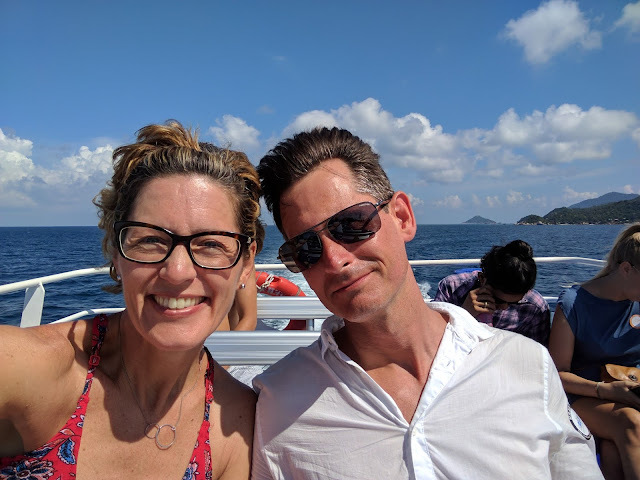 Once on the boat, it was a lovely top-deck open-air 1 ½ hour ride to Koh Phangan, where we would switch boats. After a 1 ½-hour wait on the Koh Phangan pier and no information given as to how long we would be waiting there in the sweltering sun, we boarded our next ferry that took us on the 2-hour trip to the mainland at Donsak Pier, where we were swiftly hustled onto one of the many double-decker buses waiting for the boat. 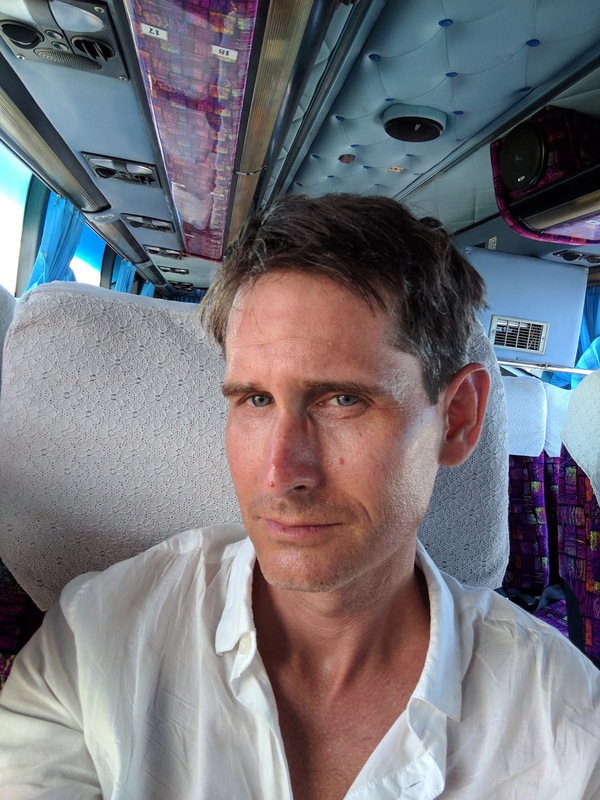 The bus ride was an uneventful 3 ½-hour drive southwest toward Krabi. We didn’t know what awaited us there, but assumed the bus wasn’t going all the way to Railay Beach. Once in Krabi, the bus driver pulled over and stopped for about 5 minutes. 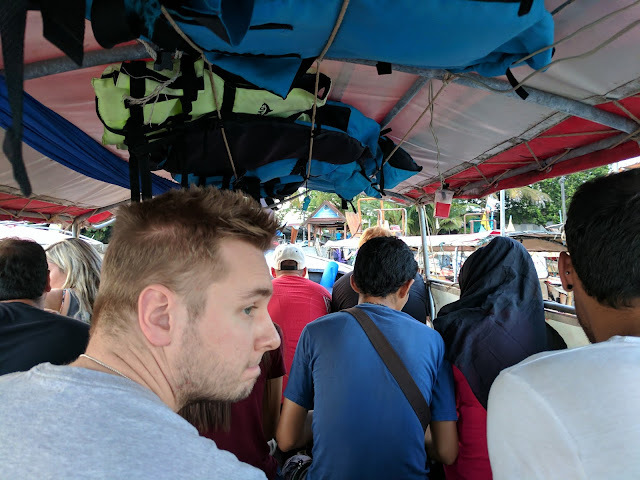 After that, he made a u-turn (no easy feat in a big coach), and we found ourselves at the ferry company office, where we were told to get out and go buy tickets to Railay. There were already many other people waiting in the open air office, spilling out into the parking lot, and we didn’t really know what we were supposed to do at that point, so we presented ourselves at the desk and asked about buying tickets. They told us to go wait (apparently we didn’t need tickets, only some people? ), which we did, until a mini-bus came and the employees started shouting “Railay! Railay! Railay!”. We hurried ourselves in, hoping this mini-bus would take us to Railay before dark. We filled the mini-bus, and waited…. We didn’t know what we were waiting for, until…oh no – the French family with all of the massive bags was going to try to squeeze into our mini-bus! 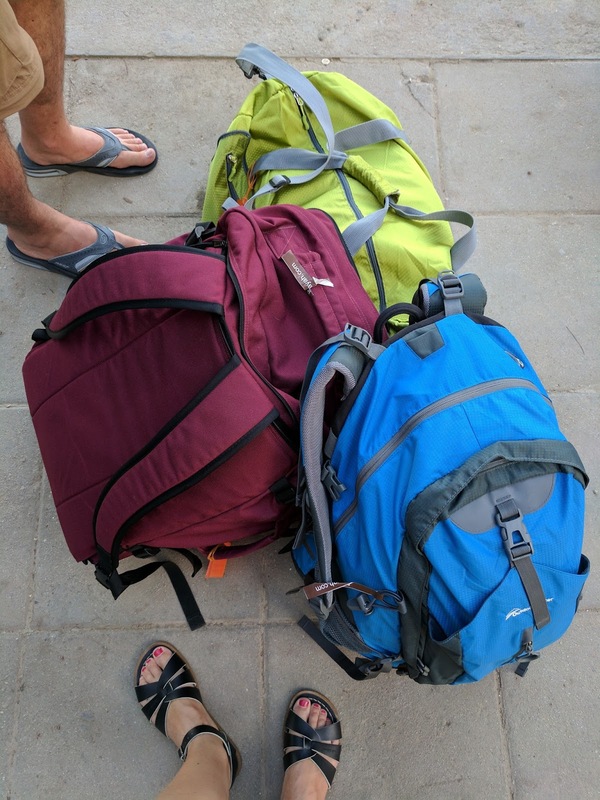 We couldn’t believe they were also going to Railay – all the way from Koh Tao with all of those freakin’ bags! And grandma! And a baby! So people re-shuffled in the mini-bus, cramming three across in the front row, and took us on a short, 15-minute ride to a dusty corner seemingly in the middle of nowhere, where there was another one of the (tiny) ferry offices. We were told to get out and go buy tickets to another ferry. Again, some people had to buy tickets, but we apparently did not have to(?). Then we were told to walk down the street, where we could see a hut at the far end of the street. Once there, we found a “parking lot” full of longtail boats, sitting side by side in the muddy, mucky waters. A short wait, and we were piled into one of them. This ride was the highlight of the day. The sun had set, the air was cooling down, the water was calm, and the views….. Wow!!! 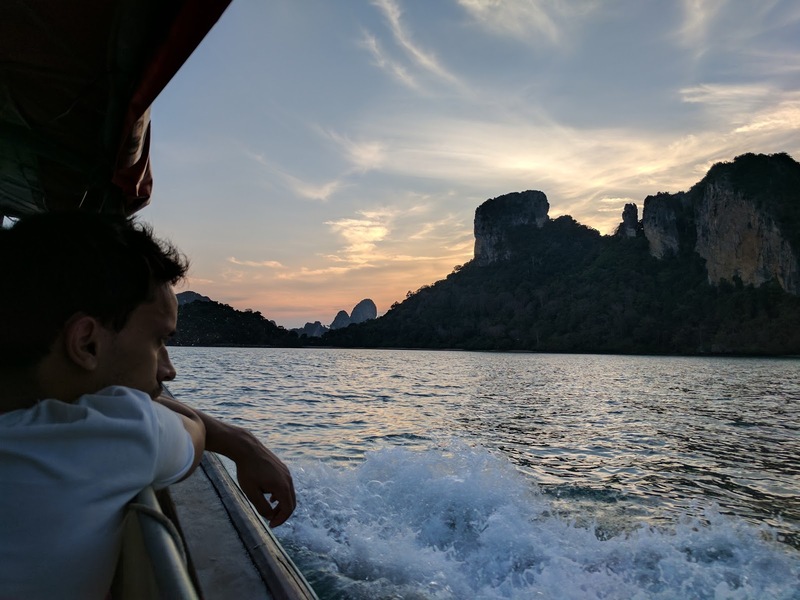 As we motored by the stunning karsts down the coast toward Railay, the scenery became more spectacular by the minute as we approached, on our 25-minute longtail ride. We both agreed that it made the whole trip worth it, just for that ride. 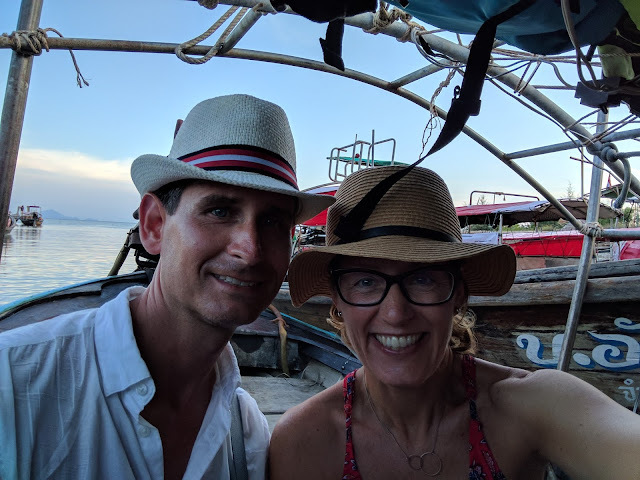 As we approached the long (easily a ¼-mile) floating dock at Railay, we could see that most of it wasn’t floating at all, but sitting in the mud. We would learn the next day that the tides have that much of an impact on the shallow waters here, that the long dock is necessary. Thankfully, we didn’t need a taxi to get to the hotel, which was situated just an easy 5-minute walk from the pier (after a 10-minute walk down the pier). We would also learn there are no taxis in Railay – no cars at all – as there are no streets here in this small, only-accessible-by-boat, beach town. It was a glorious feeling to find our lux accommodations waiting for us! More on that later. We had made it. Hopefully not every travel day will require so many transfers and so many mysteries. The most difficult part of these travel days, for control freaks like us, is that you really don’t know how you’re going to get from point A to point B. They slap those destination stickers on you, and you have to have faith that they’ll tell you where to stand, when to move, and which mode of transport you’ll need to get on next. So far, it’s worked out just fine. Look! Our bags made it too!